Part 15 of MindShift’s Guide to Games and Learning. Most people agree that implementing game-based learning makes sense for older students, but what about really young kids? Do screens have a place in early childhood education? How young is too young for screen time? If you have small children, you know that this is a hot topic among new parents. Some moms and dads believe that screen time will ruin their children. Others see tablets as an exceptional parenting gadget, a tool that can teach, distract, and educate. But reducing the issue to an on/off switch oversimplifies things. When we understand the question of electronic media in such a polarized way, we are caught in the same way of thinking that can make screen time problematic. Tablets become like junk food, imagined as a temptation that children gravitate to but need to be protected from. On the contrary, it is only when electronic media is used to occupy children -- like a babysitter that provides parents or teachers with an hour or two of peace and quiet -- that justifying its use becomes more complicated. Videos can often carry the same baggage. We sometimes think that the motivation for showing the class a movie is that the teacher’s too busy to properly plan for the day. Or maybe when the teacher needs an extra hour for grading and preparation, a documentary can keep the students occupied. Of course, this is not always the case. There are certainly good pedagogical reasons to use video content in class. Likewise, there are good pedagogical reasons to use video games and other electronic media in early childhood education. It is not about employing ed-tech for its own sake -- as if gadgets automatically make things more innovative or somehow better -- but rather about using tools that engage students toward specific learning objectives. Simply avoiding apps because of some nostalgia for a bygone era may cause educators to miss valuable early academic opportunities. The real question is not whether or not technology belongs in early childhood education, but rather, how can we leverage the efficiency of digital tools to best serve young learners. It needs to happen carefully. Although the iOS and Android app stores are both full of content labeled as educational, it is not all good content. Let us look specifically at early literacy. Many apps drill and practice letter recognition and sounds, but few are grounded in good pedagogical practices. Lisa Guernsey and Michael Levine wrote in Slate: “Most of the top-selling reading apps appear to teach only the most basic of literacy skills. They lean toward easy-to-teach tasks, such as identifying the ABCs, but don’t address higher-level competencies that young children also need to become strong readers, such as developing vocabulary and understanding words in a narrative.” Just adding the alphabet to popular games like Angry Birds or Temple Run might make parents more willing to whip out their credit cards, but it won’t necessarily teach their children how to read. Good early childhood literacy options tend to blur the distinction between "game" and "app," often looking more like apps than like traditional video games. Seeding Reading: Investing in Children’s Literacy in a Digital Age is a new series from New America’s Education Policy Program and the Joan Ganz Cooney Center at Sesame Workshop. The series (which has only just begun) looks at “early education and parenting initiatives that are harnessing new technologies.” It will also scrutinize “the marketplace of digital ‘reading’ products.” And bring information and analysis about “research that may illuminate how communications technologies and digital media are affecting the learning of reading, the act of reading, and the reading brain, in both good ways and bad.” This will become a valuable resource for early childhood educators that want to explore using games and apps in their classroom. Learn With Homer does some of the same things a good kindergarten or pre-school teacher would. It is interdisciplinary in that it “combines learning to read with learning to understand the world.” What does that mean? Kids are not only learning what the letter “A” sounds like and that “alligator” starts with “A,” but also taking virtual “field trips” to the zoo, where they learn about alligators. They also draw pictures, record their own voice discussing the subject matter, listen to stories, and play mini games that emphasize the letters, sounds, and ideas. In addition, there are less comprehensive options: apps and games that can supplement the great non-digital learning that’s already happening in early childhood education. 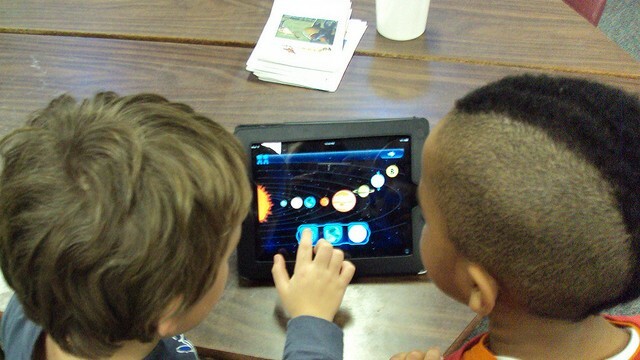 For example, ScratchJr is an iPad app from MIT’s Media Lab that lets 5-7 year-olds create games and stories using a simple drag and drop interface that is designed to provide the foundation for learning computer coding. Most of us consider coding to be part of computer science, but it is also a form of expression. It reminds us that the distinction between STEM and ELA is an arbitrary and often superficial one. Mitchel Resnick, head of MIT Media Labs Lifelong Kindergarten Research Group and one of the creators of Scratch and ScratchJr, says, “When people learn to write, they can share their ideas with the rest of the world. So too with coding.” Good kindergarten teachers understand that for young students, literacy is as much about creating a love of formal self-expression and articulation as it is about learning to write letters on lined paper. Both are necessary. Kindoma is another interesting app. It combines video conferencing, screen sharing, and reading into a single app. It was design with grandparents or traveling parents in mind. The idea was that you do not need to be right next to the child in order to both enjoy reading together. But there could also be many great classroom applications for this app. Imagine a fantastic twist on penpals. Kindergarten teachers could partner with other classrooms in other parts of the city, other states, even on opposite sides of the country. Students could have online reading buddies through Kindoma. Creative teachers will imagine tons of innovative ways to use this platform. There are plenty of games aimed at younger kids that can be part of a balanced approach to technology in early childhood education. Check out games by Toca Boca, Toontastic, or Motion Math. Imagine ways to let these games supplement and enhance your well-worn curriculum. It's especially important in a digitally connected world where everything is always on that we start teaching children the importance of text, language, and expression as early as possible. With so many options for stimulation and entertainment, it is all too easy to imagine a generation of children that grow up believing that YouTube videos replace books. One is not an alternative to the other; they are two different types of communication. Using games and apps not only offers engaging opportunities for young students to acquire important academic skills, it also teaches those students to associate screens with refined cognitive skills. It reinforces the idea that screens are more than just distraction machines. Early education should provide a foundation for critical thinking, including thinking critically about technology and digital media.